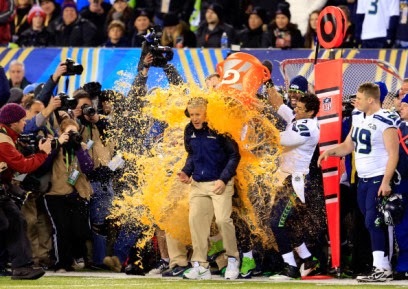 Mr Bru Cru: Superbowl 48 Thoughts. I was as disappointed as everyone else was with the Superbowl. The only people happy were 1. Seattle Seahawks fans and people who placed bets and won and 2. For this game you either won really big or lost really big. Either way it was one for the ages. The Denver Broncos couldn't find an answer to the Seahawks defense. 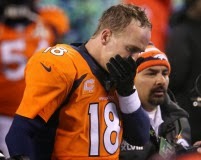 From the flip of the coin the Broncos could not seem to find their groove. 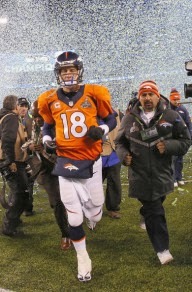 Peyton was hounded all game long by rushers and the Broncos were humiliated by Seattle. Not much fun to watch for us spectators but I'm sure Football enthusiasts will be talking about this one for a while. 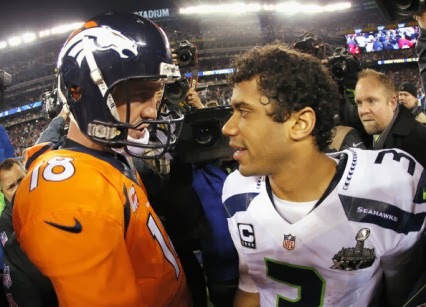 Peyton Manning's face says it all in this one. I was rooting for him to get another ring. Nonetheless he's still going to retire as a top 10 Quarterback. Maybe he'll get another shot at it but either way his legacy doesn't change much.